Apple took the whole 'bendgate' fiasco quite seriously, and a fresh report suggest it is experimenting with some new materials to adapt into the iPhone 7 and 7 Plus to ensure the issue won't be repeated. The Apple Watch Sport uses Apple's own Series 7000 aluminium alloy which is designed to be stronger than the material currently used in iPhone models and a new rumour from Taiwan's Economic Daily News suggests it'll be launching on the new set of phones. The material is 60% stronger than other aluminums but is still lightweight as it's a third of the density of stainless steel – the perfect material to be used on an iPhone. Apple received a lot of flack for the iPhone 6 Plus 'bendgate' scandal after creating a phone that could be bent easily than it should be, so it's not a big surprise the company wants to act on it for the next generation. The rumour should be taken with a heavy helping of salt though as we can't see the source Economic Daily News has used, suggesting it's just speculation from the publication or other sources. That said, it makes sense and Apple is clearly in love with its new material as it continues to cite it as one of the Watch Sport's key features. 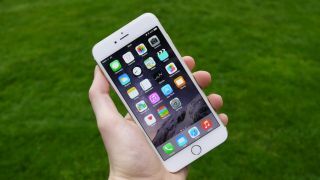 Read all the rumours on the iPhone 7 here.